Fibonacci numbers form the sequence 0, 1, 1, 2, 3, 5, 8, 13, etc. The next term is the sum of the previous two terms, A+B. The nth term is held in register S.
The initial values for the first two terms are 0 (in register A) and a 1 (in register B). They can be set to different values, but leaving both set to 0 produces (correctly) a sequence of zeros. Input register n, set to nth term required. Count register C which will be incremented. Data register A for the first term. Data register B for the second term. Sum register S of A+B. Add A to S. This is the same as placing A+B into S.
The functions are stacked in such a manner as to to allow efficient vertical linking of the data register points. We need 6 MUX lines (the Comparator requires 2). The program loop needs to cross over two pairs of lines to carry out the sequence 1,2,3,5,4. 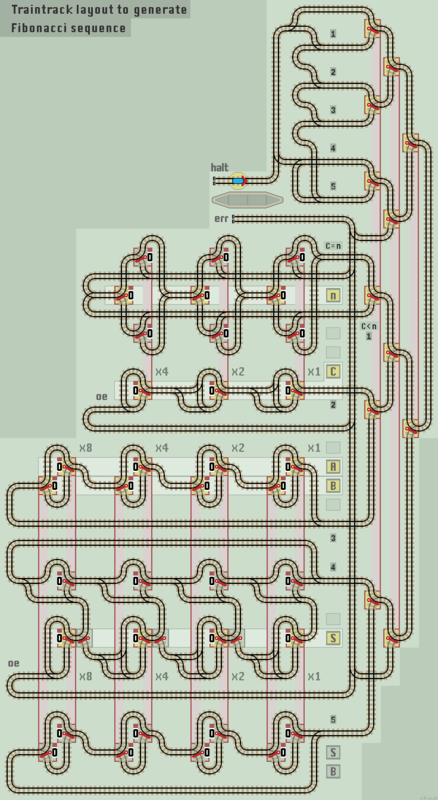 The unused MUX lines are connected back to the error line, along with the comparator 'C>n' line. The usual values of registers A and B is 0 and 1, which produces the default Fibonacci sequence. Setting A=0 and B=1 will generate the sequence 0, 1, 1, 2, 3, 5, 8 and 13. Setting A=0 and B=2 will generate the sequence 0, 2, 2, 4, 6 and 10. Setting A=0 and B=3 will generate the sequence 0, 3, 3, 6, 9 and 15 etc. After the train has halted, increment n to calculate further terms. If n is set to less than C though, an error occurs.